Little Milton døde torsdag 4. august av slag, 71 år gammel. Little Milton (egentlig Milton Campbell) startet sin karriere med Sam Phillips på Sun Records og gjorde senere plater for Chess, Stax og Malaco. Nå slipper 70-åringen ny plate på Telarc. »Think of Me« skal være i butikkene i slutten av mai. Platen er produsert av Jon Tiven, som også stod bak den utmerkede hyllest-platen til Van Morrison, »Vanthology«, der svarte artister tolket iren. Little Milton bidro her med en kanon versjon av »Tupelo Honey«. Tiven og Milton har sammen skrevet alle sangene, bortsett fra en, på »Think of Me«. Little Milton har også i senere tid vært i studio med Warren Haynes (The Allman Brothers band, Gov´t Mule) og Dave Alvin. 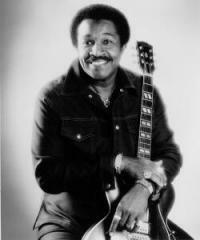 Blues singer, songwriter and guitarist »Little« Milton Campbell, whose gritty vocals and songwriting recalled B.B. King's rough-edged style, died on Thursday from a stroke, his record company said. The 71-year-old Grammy-nominated guitarist and singer known for writing and recording the blues anthem »The Blues Is Alright« never awoke from a coma following a stroke he suffered on July 27 in Memphis, said Valarie Kashimura of The Malaco Music Group. »We've lost a great soldier,« Kashimura said. Born to sharecropping farmers near the Mississippi Delta town of Inverness -- his father, »Big« Milton Campbell, was a local blues musician -- »Little« Milton picked up a guitar at age 12 and recorded his first hit for Sam Phillips' Sun Records at age 18. It was the same year the Memphis label recorded Elvis Presley for the first time. Discovered by blues-rock pioneer Ike Turner, Campbell went on to score dozens of rhythm and blues hits and was inducted into the Blues Hall of Fame in 1988. Though acclaimed in blues circles, Campbell never achieved the fame of King and some other American bluesmen. Nevertheless, his nearly constant touring took him all over the world.